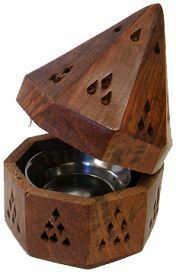 This unique cone incense wooden temple opens up on a hinge and reveals inside a silver dish for burning. This octagonal shaped temple features many cutouts for the incense smoke to billow out of to give it a cool smokey effect when burning. Approximately 5" tall and 3.5" wide.